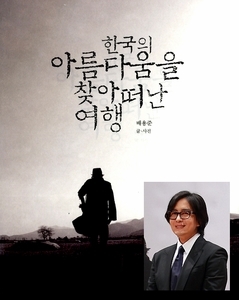 Hallyu star Bae Yong-joon, discharged Monday from a hospital after five days of treatment for an illness caused by fatigue and stress, didn't look tired or sick at all at a press event to promote his book "Discovering the Beauty of Korea," Tuesday. Dressed in a sleek black suit with a dark purple tie, the 37-year-old actor greeted fans and the press with his signature smile. "It's my first time to hold a press event for a book so I'm nervous and very excited. This book is not a fancy one written by a professional expert. It's written by a beginner who wanted to learn more about Korean culture," he said. The book carries essays and photos written and taken by Bae himself as he traveled around the country. The actor collaborated with 11 culture experts, such as tea expert Park Dong-chun, hanbok designer Lee Hyo-jae and traditional liquor expert Park Rok-dam, covering 13 traditional cultural contents including pottery, hanbok designs and food over the past year. "It was during a press conference in Japan (when I first thought of writing a book). One reporter asked me if there were any places in Korea I would like to recommend to fans. When I couldn't find an answer, I realized how little I knew about our culture," Bae said. "My first plan was to write a book about tourists spots and restaurants in Korea, but then I thought it would be more meaningful if I explored the culture and the people first." A short clip that showed Bae's journey included meeting designer Lee Sang-bong to discuss the beauty of hangeul; visiting the National Museum of Korea to learn about Korea's history; stopping by Baekheungam Temple, North Gyeongsang Province, to taste temple food; joining Jeon to make pottery using traditional techniques; and even spending a few days at Woljeong Temple, Gangwon Province, for a templestay. Traditional lacquer expert Jeon Yong-bok said he was very surprised when he heard that Bae was hospitalized. "I believe it was because he threw himself in making the book. This project was a very difficult one, but Bae showed deep interest and was ever so eager to learn more about the Korean culture," he said. With short essays describing the lessons and experiences he went through, the book offers aspects of Korean culture even Koreans have forgotten, from applying lacquer to furniture, pottery making and singing traditional songs. Considering his health, the actor said that he lost 10 kilograms and he now understood the difficulties authors and reporters tend to go through when writing. "The most difficult thing was meeting the deadline," he said laughing. "It was interesting, as soon as the deadline came closer, the words came to me!" Being one of the most popular hallyu stars in Japan, Bae's book attracted Japanese fans and reporters as well. According to his agency, the publishing copyright for the book were sold to a Japanese book agency for a whopping 800 million. The average copyright for foreign books in Japan is around 92 million won. "I have learned that it is not ability, fame or money that is important (in preserving the Korean culture), but a true heart. I thank everyone who taught me this," Bae said. Readers can find "Discovering the Beauty of Korea" in bookstores today.